Medipass Healthcare announces installation of the newly launched Versa HD Radiotherapy System for cancer treatment in the Leeds Cancer Centre as part of its Managed Equipment Service. Click Here, (page 2) to view the press release or click here to download in PDF format. 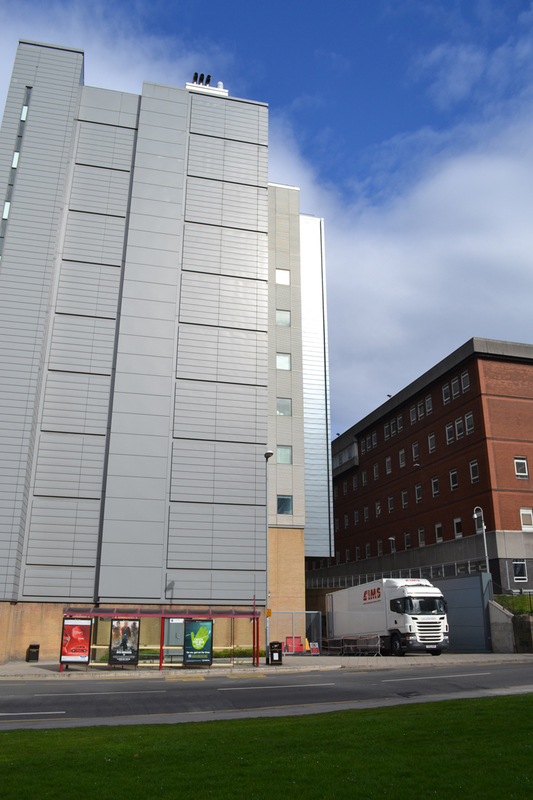 Under a 15-year MES contract one of the mobile image intensifiers at St James's Hospital in Leeds has been replaced with a Philips BV Pulsera. This followed an evaluation of all equipment from all vendors and equipment selection by the Trust clinicians. 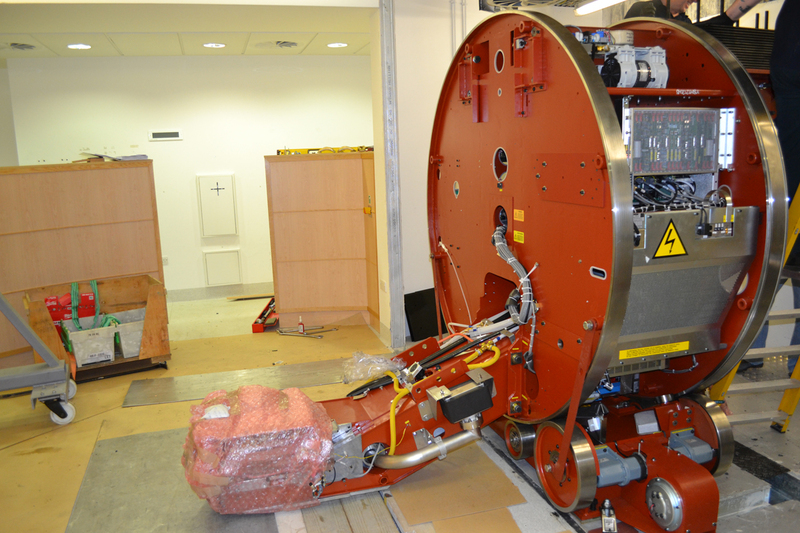 Under a 15-year MES contract two new linear accelerators are being installed at Kailash Hospital, India. One machine is a state of the art ‘True Beam’. Clinical commissioning will commence in February 2013. This January 2013, a new deal has been signed for the rapidly growing Indian side of Medipass. Equipment has already been delivered, ready for installation. This is an 8-year contract for a PET-CT service in the Medcare site in Mumbai. 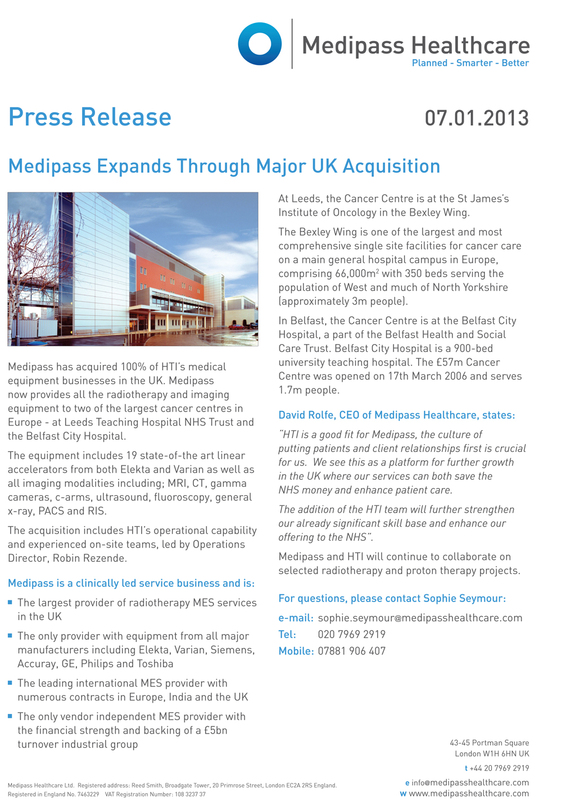 Medipass has acquired 100% of HTI’s medical equipment businesses in the UK. 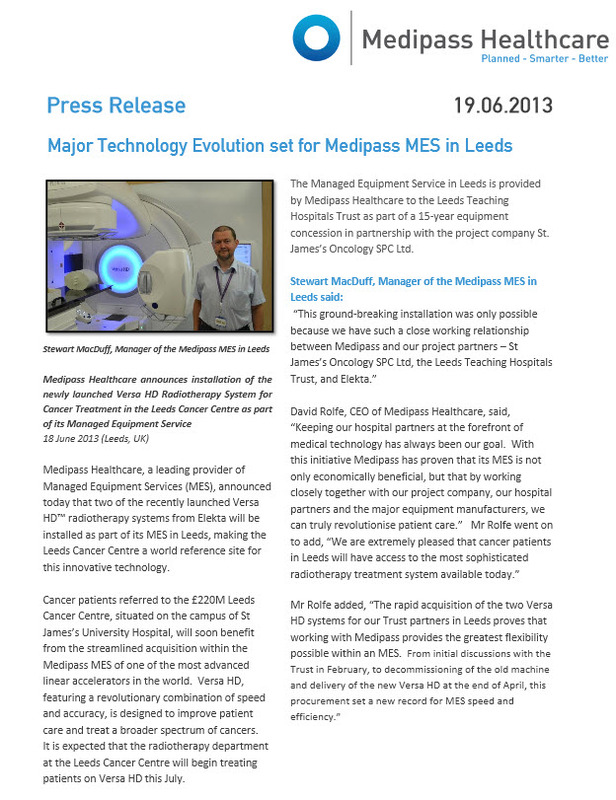 Medipass now provides all the radiotherapy and imaging equipment to two of the largest cancer centres in Europe. Click Here to view the full press release or click here to download in PDF format. A 15-year MES deal for provision of radiotherapy equipment and services, including provision of an Elekta linear accelerator, has been signed with the Birla Institute of Medical Sciences in the beautiful Gwalior area, 300km South of Delhi. The 15-year project is for the provision Linac with IGRT capability which is much needed in the area that currently only has a cobalt machine. Medipass has been selected for the vendor neutral managed service framework managed by Barts Health NHS Trust on behalf of the London Procurement Programme (LPP). 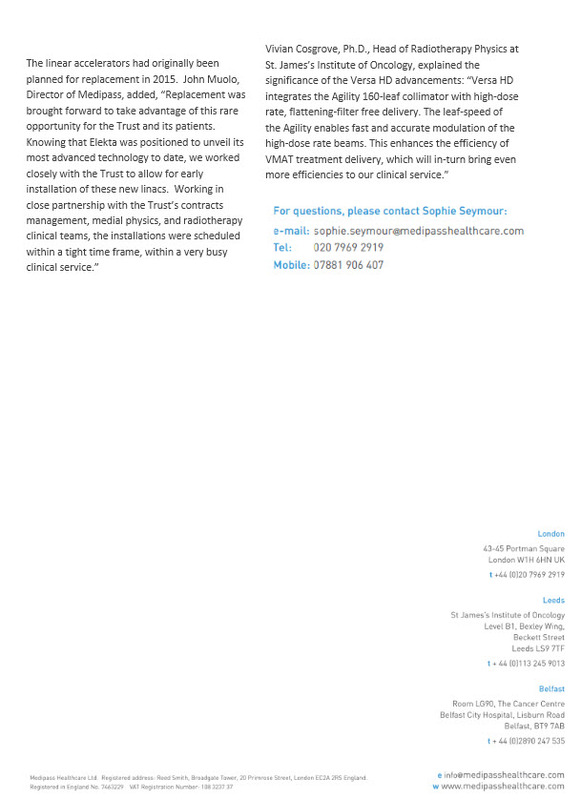 The framework allows any NHS Trust to commence a managed service faster and cheaper. A new dual energy, 6 elctron, Elekta Synergy Platform linac has been installed at the Valentis Cancer Care Hospital. Patients will benefit from the full range of radiation therapy, including IMRT. 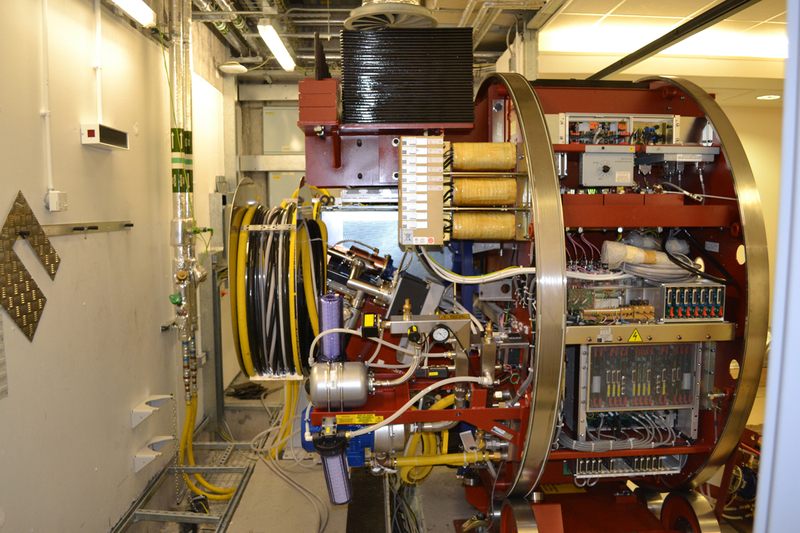 The linac will be fully operational from August 2012 after clinical commissioning is complete. A new multi slice CT scanner from GE, and 1.5T MRI from Siemens have been commissioned and gone fully operational at Synergy Hospital in Indore. This 10 year project is at a new 140 bed hospital, backed by a group of 10 leading specialist clinicians. Medipass has been selected for the MES framework agreement managed by procurement specialists NHS Commercial Solutions. The framework allows any NHS Trust to procure an MES faster and cheaper than before as the OJEU process has been completed in advance. Medipass is collaborating with the renowned Institute of European Oncology (IEO). Professor Veronesi who heads the centre is personally leading the collaboration. Professor Veronesi is one of the world's leading oncology specialists, as well as now heading Italy's Nuclear Safety Agency. Medipass has installed the latest dual energy Elekta Synergy IMRT linear accelerator at the O.P.Jindal Institute of Cancer & Research. The equipment has been commissioned and started treating patients using IMRT on 10th September. Dr Sharma, is the medical director of the hospital. Medipass are delighted to have been short-listed for the Royal Bournemouth & Christchurch Hospitals Foundation NHS Trust MES project. The scheme is expected to cover CT, MRI, x-ray, ultrasound, image intensifiers and nuclear medicine. A multi disciplined MES deal has been signed for the rapidly expanding hospital at Indore in India. The scheme includes the provision of a 64 -slice CT scanner and an MRI scanner on a long term contract including commissioning and on-going maintenance.